A cold, clear November afternoon in 2007. Sarah, my youngest daughter, is nine years old here, and on the swing at our favourite beach, Willows Beach in Victoria. We’ve arrived with just minutes of sunlight left in the day. Despite the chilly temperature, the swing is fun for us both. But it’s so cold that Sarah uses her coat sleeves to protect her hands from the metal chains. The game is on – who can claim the high-altitude bragging rights? That’s followed shortly by the mandatory “1 ... 2 ... 3 ... under-duck push!” We have very set patterns and expectations around our swing shifts. Aside from my wall murals, this is the largest painting I have done to date. 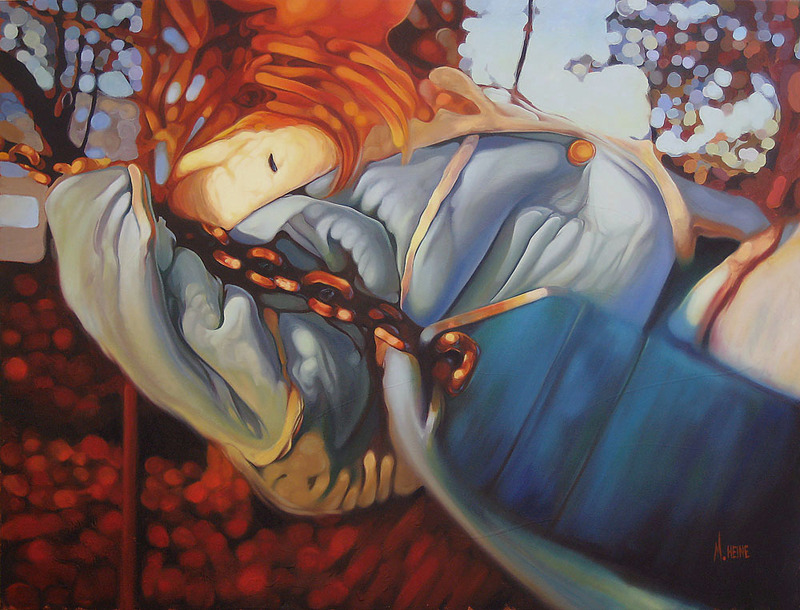 It was also the first painting I completed for my first solo show, “At Play” for June 2008. In this painting, I experimented for the first time with a sense of motion, something that I intend to pursue in future paintings. The original photo I shot had a slight indication of that, but I’ve embellished it in the final price. I’ve tried to lead the eye into the painting through the chain in the top left, through the focal point in Sarah’s jacket, and down to the motion of the swing’s seat. Become a Friend of Mark Heine's studio.